KIDS Hummingbird Writing Contest! - Hey kids, write a story, win a prize. "Why Did Jesus Make the Hummingbird"
"How the Hummingbird Got Its Name"
Congratulations to the winners, we would like to thank all of you who submitted a poem. We would also like to thank all the parents, teachers, friends and relatives for their support and encouragement. Hey Kids!....We are excited to host our first kids hummingbird writing contest to give you a chance to write a story and maybe you'll win a prize! When you submit a story you will have your own web page! Tip: You can visit some other pages on our site and learn more about hummingbirds to help write your story. 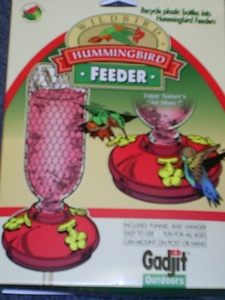 "Everything you need (except your recycled bottle) to make your own "Recycler" Hummingbird Feeder". Turn a recycled soda bottle into a hummingbird feeder. A funnel for easy filling. Turn a soda bottle into a hummingbird feeder. You can mount it on a post or hang it. It includes separate feeding flower perches that snap into each of three holes on top of the base, a net to secure the soda bottle, a three prong hanger that attaches to the net for secure handling, and a funnel for easy filling. Minimum of 300 words for submission. Submit original work written by you. Contest open to ages 6 to 12. Fill out the "name" box and be sure to include your age. Winners will be selected based on visitor comments(favorites). Submissions deadline is May 31, 2011. Winners announced June 15, 2011. Here is your chance to show off your work and invite all your friends and relatives to leave praises with their comments. You may also submit a picture to illustrate your story, this is optional and not necessary to enter the kids hummingbird writing contest. You will see a "Thank You" page after your submission, please leave your email address here so we can send a notification if you are the Winner. Note: Your submission signifies agreement to grant to hummingbird-guide.com an exclusive, royalty-free, irrevocable, transferable, perpetual license to publicly display your submission on hummingbird-guide.com and re-publish any submission.